Jeremy Nasta was born in 1974 and started playing drums when he was five. He played in all the school bands and orchestras and was Principal Timpanist with the Tuscon Philaharmonic Youth Orchestra for five years. He went on to study percussion at the University of Arizona School of Music and Dance. He has been accompanist and composer here since 1993, receiving commissions from choreographers for his unique style of music. He won the 1997 Percussive Arts Soceity Composer's Contest. He is the percussionist for Tucson's premiere Flamenco troupe Flamenco Y Mas and played a summer of classes and concerts for the 2002 American Dance Festival. He is a member of The International Guild of Musicians in Dance. His versatility in instrumentation, voice and composition combines with his originality and energy to culminate in his CD Ethereal. 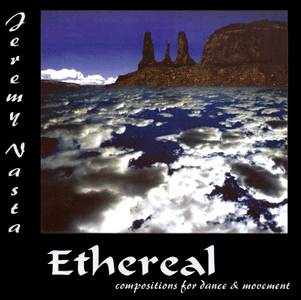 Ethereal - Compositions for Dance and Movement - $15.00.